Why in hell do I know this? More importantly, why does it matter? It was a circuitous journey, to be certain. I’m planning the first leg of the arrival of Leeloo to Dallas. The stop near Oklahoma is to make sure we pass through The Pioneer Woman’s Mercantile. The challenge with this trip is that it’s over Memorial Day weekend. What I’ve found is that the public “camping” spots are full, or require a 3 days stay. Heather likes the Ree and all, but we have stuff to do. A few of the options available to RVers for free overnight stays are: Flying J truck stops (specifically with an RV Parking area), Cracker Barrel, Walmart, and occasionally a city park/facility. There are more, but for the sake of brevity (and frankly, our experience level), those illustrate the point. I’d settled on a Flying J, but then remembered that many of the RV organizations make it clear that RVs aren’t generally welcome, nor should they stay at truck stops. I understand the reasoning – truckers have fewer and fewer places to sleep. If RVers are taking the spaces then truckers have a harder time sleeping. That’s bad for all of us in the long run. Flying J specifically makes it clear we’re welcome, so we’ll use their facilities this trip. As a backup, I started looking at Walmart in the same area. Whether you can stay overnight depends on the store manager and local zoning, so you should call ahead. Upon landing on the store’s page at Walmart.com, I was presented with marketing for feminine hygiene products. Way to go, Walmart! While they don’t apply to me, they do to Heather. Well, did. 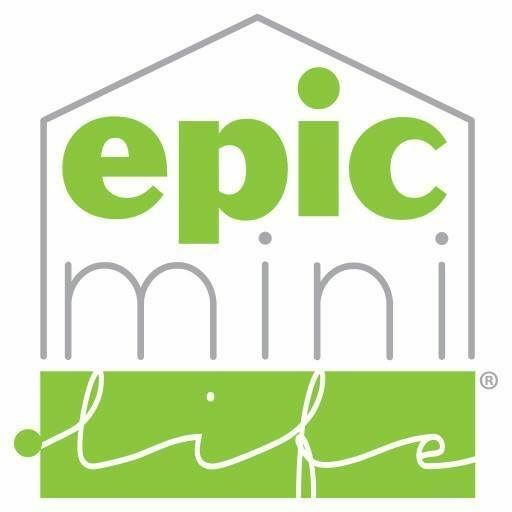 If you’re new to the adventure, Epic Mini Life is more than a family of three and two dogs traveling north America in an RV. It’s a lifestyle movement – digital, smaller, lighter, minimal, and with a solid goal of eating well (though inexpensively), recycling, and as close to zero waste as possible. That’s a bunch to bite off, but this post centers on the last one. If you were counting, 10 total pages of products at 24 items per page means nearly 240 items a woman chooses from at Target (I chose Target for the example because they have specific categories for each, and it was easy math). The quantity of plastics and chemicals that go into making these products, and the resulting waste is tremendous. For one individual over a lifetime, it’s significant. For hundreds of millions, it’s eye opening. Now, why does it matter? Heather opted out of the use of disposable feminine products, and instead moved to a reusable solution called the Diva Cup. There are many varieties of these implements dating back to the early 1900’s, and they’ve gained favor recently as a reusable, stress free solution to a never ending need. The more we (you and I) choose to reduce our impact, the less weight we’ll feel traversing life itself. As we reduce our square footage, we have less room for the clutter of life. Everything is intentional. How much does it weigh? How much power does it use? How many functions does it serve? Is it sustainable? Recyclable? What am I willing to give up to bring this item into my life? Challenge, find one box of “things,” right now, to drop off at your local thrift store today.